Vermont U.S. Sen. Patrick Leahy is helping commemorate the 80th birthday of his childhood hero, Batman. MONTPELIER, Vt. — Vermont U.S. Sen. Patrick Leahy has spent much of his adult life crusading for the issues that are important to him and now he’s helping to commemorate the 80th birthday of his childhood hero, Batman, the caped crusader, who Leahy credits with helping him win a ban on the export of land mines. 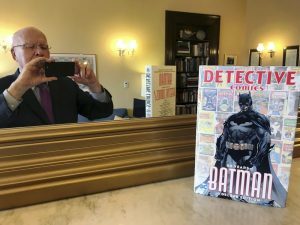 For more than two decades, the Vermont Democrat has sprinkled his fascination with the superhero who has no superpowers into his work in the United States Senate, including working with DC Comics to produce a 1996 Batman issue that highlighted the dangers of land mines, which Leahy credits with helping the Senate pass one of a series of anti-land mine measures he has worked on over the years. Saturday is the 80th anniversary of when Batman first appeared in the Detective Comics edition released March 30, 1939. Earlier this year DC Comics published an 80th Anniversary coffee-table book and on Wednesday DC released the 1,000th issue Batman comic book issue. Leahy, who turns 79 on Sunday and has had small roles in five Batman movies, wrote the forward to the anniversary edition. In the forward Leahy, who was born a year after the first Batman comic was released in 1939 said Batman, a millionaire who turned into a fully human superhero after his parents were murdered, turned to crime fighting and in the process helped people, mostly children, cope with unsettling times in the world of the 1940s and 1950s. In an interview with The Associated Press, Leahy said he began reading Batman comic books when he was a child in the early 1940s. One local comic-book seller in his hometown of Montpelier even knew to tap on the window of her store to let the young Leahy know the latest edition had arrived as he walked by. Fast forward half a century and Leahy recalls a discussion on copyright issues with officials from DC Comics. Someone made a reference to Batman and Leahy corrected a reference to an early Batman issue, down to the page. The officials from DC checked their archives and Leahy was right. That led to a forward by Leahy for an earlier Batman anthology. Leahy asked them for help in getting Congress to pass the land mine ban. “They loved the idea,” Leahy said. When the vote came up in the Senate, copies of the Batman land mine edition, “Death of Innocence,” were placed on the desks of all of Leahy’s Senate colleagues. Initially Leahy felt he had the support of at best seven or eight colleagues. “It was one of those rare things, all 100 Senators voted for the ban,” Leahy said.